Backup of playout channels is implemented with the aid of synchronous operation of a pair of SL NEO servers: the main server and the backup server. Herewith, the main server operates in the regular mode, while the backup server constantly synchronizes all its playlists (including graphics) and playout channels with the main server with a precision of up to just a few frames. In case of a failure or an unexpectable stop of the main server, the backup server automatically stops synchronizing and continues autonomous playout of all its playlists. Adjusting the playback service/channel synchronization for the SL NEO main and backup servers is implemented from the control panel - Administrator Control Panel, while the server software is operating. Login to the console is implemented locally from the server, or from any computer in the network by the address http://ip address:7901. 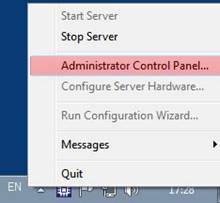 You should login to the control console as an administrator. After login to the backup server control console, select Manage from the left-hand menu; find the tab Program Outputs, choose the item Main/Backup Sync in the window Program Output 1. In the field Sync Method choose Online Continuous - the mode of constant, uninterrupted synchronization. In the field Sync Source Access, enter the IP address of the synchronization source Ц the main server Ц to the field Sync Source Program, choose У1Ф (the first playout channel with all graphics layers). It is necessary to implement similar procedures for all remaining playout channels, changing the parameter Sync Source Program in the corresponding fields. Press Apply Changes in the upper section of the control console window. The playout channel will be reloaded, playback on the backup server will be suspended. Configuring the Mode of One-time Synchronization of the Main Server from the Backup Server. After restoring the workability of the main server, you may need reverse synchronization - it may be necessary to synchronize playlists of the main server from the backup server once. This mode must be configured on the main server. After login to the main server control console, select Manage from the left-hand menu, then choose the tab Program Outputs, open the item Main/Backup Sync in the window Program Output 1. In the field Sync Method, choose Manual One Time Only - the mode for the manual one-time synchronization. In the field Sync Source Access, enter the IP address of the synchronization source Ц the backup server Ц in the field Sync Source Program, choose У1Ф (the first playout channel with all graphics layers). It is necessary to implement similar procedures for all playout channels of the main server, changing the parameter Sync Source Program. Press Apply Changes in the upper section of the control console window. Herewith, the playout channel will be reloaded and playback on the main server will be suspended. After configuring the server part, synchronization must be turned on from the client side. In order to activate synchronization of playlists of the main and backup server sets, use the menu by the right-click in each Broadcast window (the lower left-hand side of the window). Grey square, inscription N/A Ц the synchronization function at the УneighboringФ server is not configured; synchronization is impossible. Red square, inscription NLK - the "adjacent" server is configured and exists, but automatic synchronization is off. The command Lock Master Playlist at the backup set turns on the mode of constant automatic synchronization. The red indicator is changed to green, and the inscription LK is displayed. This mode is possible only in the scheme N+N (100% duplication of servers and playout channels). The command Unlock Master Playlist in the backup system turns off the mode of constant automatic synchronization. The green indicator changes its color to red NLK. After restoring the operability of the main server, you may need reverse synchronization - that is, it may be necessary to synchronize the playlist of the main server from the reserve server once. The command Synchronize Once on the main server is used for this purpose. The command Lock Master Playlist Offline at the backup set turns on the mode of constant automatic synchronization for playlists only (the so-called УvirtualФ synchronization, in which the playlist windows are synchronized, but the output boards and the corresponding server players are still). The red indicator changes its color to yellow, and the inscription LK appears. This mode is possible in the scheme N+1ЕM (partial duplication of servers and playout channels). Transfer of the chosen playout channel to the active synchronization mode can be implemented by the command Lock Master Playlist in the backup system. For the quick, simultaneous synchronization of all groups of playlists on the main and the backup server (lists of full screen playback for all channels + playlists for graphics playback), you should use the Air Manager menu item File/Sync to All Masters. When managing playback of graphic events of the main playlist from the list of secondary events, there is no need to synchronize the graphics playlists on the backup server; it is sufficient to turn on synchronization of the main playlist only.